Garden trellis fencing can transform your garden into a beautiful outdoor space. You can create private nooks and crannies, hide unsightly bins or simply use trellises on your borders. This type of fencing can create privacy without the solid and sometimes overpowering appearance of a more traditional fence – especially in a small garden. Have you ever wanted to make changes in your garden? Hide ugly features like old sheds and compost heaps or just divide it into separate “rooms” like they do on the TV shows? There’s an easy way to take care of all this if you make trellis fencing your garden friend. It’s easy to grow climbing plants up any sort of trellis, whether there are the self-clinging variety or you use the trellis-work to tie in branches. Use your imagination to create an individual work of art to impress your friends and neighbours! You could even use your trellis fence to support the growth of vegetables and fruits to provide an edible garden wall. 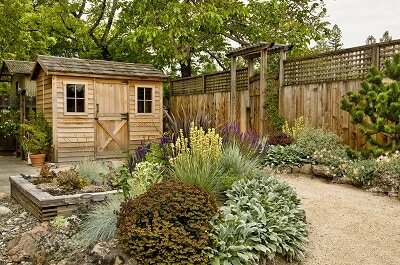 You could hide an ugly shed or compost heap by judiciously siting an attractive fence, adorned with flowers or fruits. As well as providing a framework for climbing plants, your trellis can act as a rustic backdrop for shrubs and flowers without bringing the enclosed feel of a traditional wooden fence. When used in this way it’s possible to hide all manner of garden clutter, whilst maintaining a light and airy feel to your garden. Or add brackets to the fence posts and hang flowering baskets to give colour all year round. As well as dividing the garden into decorative areas, trellis fences can be used to direct the eye or lead you into separate parts of the garden. There’s nothing more enticing in a garden than discovering hidden areas and different aspects. Maybe you want to highlight a feature like a pond or a prized garden statue. The backdrop provided by well-chosen fencing will enhance your feature. Even in sunny Sussex we often suffer from cold northerly or easterly winds, particularly on sunny days in the spring and autumn. How many times have you sat in a sunny spot indoors wishing you could sit in the garden and still be warm? Using trellis fencing to shield you from prevailing winds, you can install a windbreak to create sunspots in the garden. There’s nothing worse than planning a relaxing afternoon on the patio, relaxing with a favourite book, only to find that a chilly wind drives you indoors. With careful siting, you can make your garden a far more inviting place to sit on those not-quite-summer days. The trellis will break up the wind enough to offer shelter to you and your family and it makes an attractive feature too. Horsham Fence Contractors are experts in all things fencing so please don’t hesitate to call us on 01403 540132 if you’d like to discuss your garden ideas with our team. We’ll take care of everything with the minimum of disruption and turn your garden into an outdoor space to be proud of.